England's Commonwealth Games team actually hail from Africa, according to none other than the tournament's organisers. The blooper, made in the official programme for the opening ceremony of the Gold Coast Games taking place in Queensland, Australia, today was spotted by various athletes and the media. 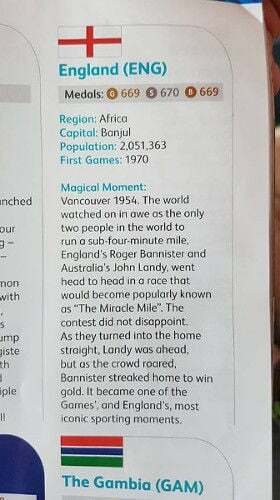 In what appears to be a good old-fashioned copy-paste blunder, England's "region" is given as Africa, its capital as Banjul and its population as "2,051,363". The figures are, in fact, those for The Gambia, a small West African nation. For the geographically confused, England's population is in the region of 53 million, according to official estimates, while its capital is believed to be London, which on its own has a population four times the size of The Gambia. The Australian Broadcasting Corporation reported dismayed local Diane Smith as saying: "I think it's appalling. If you can't get where England is right it's not good is it?" Mark Peters, chief exec of the Commonwealth Games Corporation, blamed the cockup on the late addition of The Gambia to the games, telling the broadcaster: "There was an overprint. We found out about it maybe 10 days ago." "We went and spoke to England and said 'Congratulations, the Commonwealth's changing and it has since Brexit, and part of you is now part of Africa'."